Kattankudy Urban Council (KUC) is the local authority for the town of Kattankudy in eastern Sri Lanka. KUC is responsible for providing a variety of local public services including roads, sanitation, drains, housing, libraries, public parks and recreational facilities. It has 9 members elected using the open list proportional representation system. Local government is the third and lowest level of government in Sri Lanka – after the central government and provincial councils. The local government bodies are collectively known as local authorities. They are responsible for providing a variety of local public services including roads, sanitation, drains, housing, libraries, public parks and recreational facilities. Local authorities are divided into three different groups: municipal councils, urban councils and divisional councils. As of November 2017 there were 341 local authorities. All local authorities are elected using the mixed electoral system. Kattankudy (Tamil: காத்தான்குடி, Sinhala: කාත්තාන්කුඩි also transliterated as "Kathankudy" is a township in Sri Lanka, located along its eastern coastline, about 339 km away from Capital - Colombo. The following candidates were elected:  Sahul Hameed Mohamed Asfer (SLMC); Aliyar Lebbe Abdul Jawath (SLMC); Meera Mohaideen Kalanther Lebbe (SLMC); Ahamed Lebbe Mohamed Marzook (SLMC); Umar Lebbe Mohamed Noorul Mubeen (SLMC); Abdul Majeedu Mohamadu Rauffu (UPFA); Abdul Azeez Mohamed Rooby (NC); Atham Lebbe Mohamed Saleem (SLMC); and Abdul Sathar Muhammed Zulfi (Ind 3). Aliyar Lebbe Abdul Jawath (SLMC) and Umar Lebbe Mohamed Noorul Mubeen (SLMC) were appointed Chairman and Deputy Chairman respectively. Janaka Bandara Tennakoon is a Sri Lankan politician and a member of the Parliament of Sri Lanka. He is currently the Minister of Lands and Land Development. He was educated at Dharmaraja College, Kandy. He contested as the Group Leader of the Matale District of the Central Province and was elected to the Provincial Council with a majority of Proportional Votes in 1993; Elected as a Member of Parliament with a majority of proportional votes in the General Election of 1994; Elected as a Member of Parliament from the District of Matale with the majority of proportional votes in the general election of 2000. The following candidates were elected:  Hayathu Mohamed Mohamed Bakkir; Asfar Mohamed Shahul Hameed (UPFA); Abdul Gafoor Muhamathu Haroon; Mohamed Ibraheem Mohamed Jaseem (UPFA); Mohamed Musthafa Abdul Latheef; Muhamathu Musthafa Abdul Rahuman; Abdul Majeed Mohamed Rauff; Ameer hamsa Ummu Salma; and Mohamed Sudeek Mohamed Siyad. Asfar Mohamed Shahul Hameed (UPFA) and Mohamed Ibraheem Mohamed Jaseem (UPFA) were appointed Chairman and Deputy Chairman respectively. Batticaloa Electoral District is one of the 22 multi-member electoral districts of Sri Lanka created by the 1978 Constitution of Sri Lanka. The district is conterminous with the administrative district of Batticaloa in the Eastern province. The district currently elects 5 of the 225 members of the Sri Lankan Parliament and had 344,750 registered electors in 2010. Trincomalee Electoral District is one of the 22 multi-member electoral districts of Sri Lanka created by the 1978 Constitution of Sri Lanka. The district is conterminous with the administrative district of Trincomalee in the Eastern province. The district currently elects 4 of the 225 members of the Sri Lankan Parliament and had 246,890 registered electors in 2010. Ampara Electoral District is one of the 22 multi-member electoral districts of Sri Lanka created by the 1978 Constitution of Sri Lanka. The district is conterminous with the administrative district of Ampara in the Eastern province. The district currently elects 7 of the 225 members of the Sri Lankan Parliament and had 436,148 registered electors in 2010. Mohamed Najeeb Abdul Majeed is a Sri Lankan politician, former Member of Parliament and former Chief Minister of Eastern Province. Colombo Electoral District is one of the 22 multi-member electoral districts of Sri Lanka created by the 1978 Constitution of Sri Lanka. The district is conterminous with the administrative district of Colombo in the Western province. The district currently elects 19 of the 225 members of the Sri Lankan Parliament and had 1,552,734 registered electors in 2014. Kandy (Mahanuwara) electoral district is one of the 22 multi-member electoral districts of Sri Lanka created by the 1978 Constitution of Sri Lanka. The district is conterminous with the administrative district of Kandy in the Central province. The district currently elects 12 of the 225 members of the Sri Lankan Parliament and had 970,456 registered electors in 2010. Jaffna Municipal Council is the local authority for the city of Jaffna in northern Sri Lanka. JMC is responsible for providing a variety of local public services including roads, sanitation, drains, housing, libraries, public parks and recreational facilities. Established in January 1949 as a successor to Jaffna Urban Council, it currently has 45 members elected using the mixed electoral system. Batticaloa Municipal Council (BMC) is the local authority for the city of Batticaloa in eastern Sri Lanka. BMC is responsible for providing a variety of local public services including roads, sanitation, drains, housing, libraries, public parks and recreational facilities. It has 19 members elected using the open list proportional representation system. The territory of BMC is commensurate with that of Manmunai North Divisional Secretariat. Vavuniya Urban Council is the local authority for the city of Vavuniya in northern Sri Lanka. VUC is responsible for providing a variety of local public services including roads, sanitation, drains, housing, libraries, public parks and recreational facilities. It has 11 members elected using the open list proportional representation system. Kalmunai Municipal Council (KMC) is the local authority for the city of Kalmunai in south-eastern Sri Lanka. KMC is responsible for providing a variety of local public services including roads, sanitation, drains, housing, libraries, public parks and recreational facilities. It has 19 members elected using the open list proportional representation system. Akkaraipattu Municipal Council (AMC) is the local authority for the town of Akkaraipattu in south-eastern Sri Lanka. AMC is responsible for providing a variety of local public services including roads, sanitation, drains, housing, libraries, public parks and recreational facilities. It has 9 members elected using the open list proportional representation system. Eravur Urban Council (EUC) is the local authority for the town of Eravur in eastern Sri Lanka. EUC is responsible for providing a variety of local public services including roads, sanitation, drains, housing, libraries, public parks and recreational facilities. It has 9 members elected using the open list proportional representation system. Kinniya Urban Council (KUC) is the local authority for the town of Kinniya in eastern Sri Lanka. KUC is responsible for providing a variety of local public services including roads, sanitation, drains, housing, libraries, public parks and recreational facilities. It has 7 members elected using the open list proportional representation system. Mannar Divisional Council is the local authority for Mannar DS Division in northern Sri Lanka, except for the town of Mannar which has its own local authority. MDC is responsible for providing a variety of local public services including roads, sanitation, drains, housing, libraries, public parks and recreational facilities. It has 9 members elected using the open list proportional representation system. Manthai West Divisional Council is the local authority for Manthai West DS Division in northern Sri Lanka. MWDC is responsible for providing a variety of local public services including roads, sanitation, drains, housing, libraries, public parks and recreational facilities. It has 12 members elected using the open list proportional representation system. Musali Divisional Council is the local authority for Musali DS Division in northern Sri Lanka. MDC is responsible for providing a variety of local public services including roads, sanitation, drains, housing, libraries, public parks and recreational facilities. It has 9 members elected using the open list proportional representation system. Venkalacheddikulam Divisional Council is the local authority for Venkalacheddikulam DS Division in northern Sri Lanka. VDC is responsible for providing a variety of local public services including roads, sanitation, drains, housing, libraries, public parks and recreational facilities. It has 9 members elected using the open list proportional representation system. 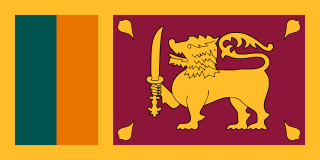 The 2nd Eastern Provincial Council is the current Eastern Provincial Council, with the membership determined by the results of the 2012 provincial council election held on 8 September 2012. The council met for the first time on 1 October 2012. According to the Constitution of Sri Lanka the maximum term of a provincial council is 5 years from the date of its first meeting. Mahamood Lebbe Alim Mohamed Hizbullah is a Sri Lankan politician and state minister. Kabeeb Mohamed Thowfeek is a Sri Lankan politician and former Member of Parliament. ↑ "Kattankudy Urban Council". Government of Sri Lanka. Archived from the original on 2011-09-28. ↑ "Local Authorities Election 2006 Final Results Kattankudi Urban Council". Department of Elections, Sri Lanka. ↑ "PART IV (B) — LOCAL GOVERNMENT Notices under the Local Authorities Elections Ordinance THE LOCAL AUTHORITIES ELECTIONS ORDINANCE (CHAPTER 262)" (PDF). The Gazette of the Democratic Socialist Republic of Sri Lanka. 1447/36. 2 June 2006. Archived from the original (PDF) on 4 October 2011. ↑ "Extraodinary Gazette No. 1633/09" (PDF). The Gazette of the Democratic Socialist Republic of Sri Lanka. Government of Sri Lanka. 23 December 2009. Archived from the original (PDF) on 22 July 2011. ↑ "Local Authorities Election - 17.03.2011 Batticaloa District Kattankudi Urban Council". Department of Elections, Sri Lanka. ↑ "PART IV (B) — LOCAL GOVERNMENT Notices under the Local Authorities Elections Ordinance (Chapter 262) LOCAL AUTHORITY ELECTIONS ORDINANCE" (PDF). The Gazette of the Democratic Socialist Republic of Sri Lanka. 1699/5. 28 March 2011. Archived from the original (PDF) on 4 October 2011.